I tried quite a few new recipes for the first time this past week! Some of them I published already, but my Saturday Spotlight is going to shine today on a few more. I found some really special ones on other blogs, and they turned out even better than I hoped. 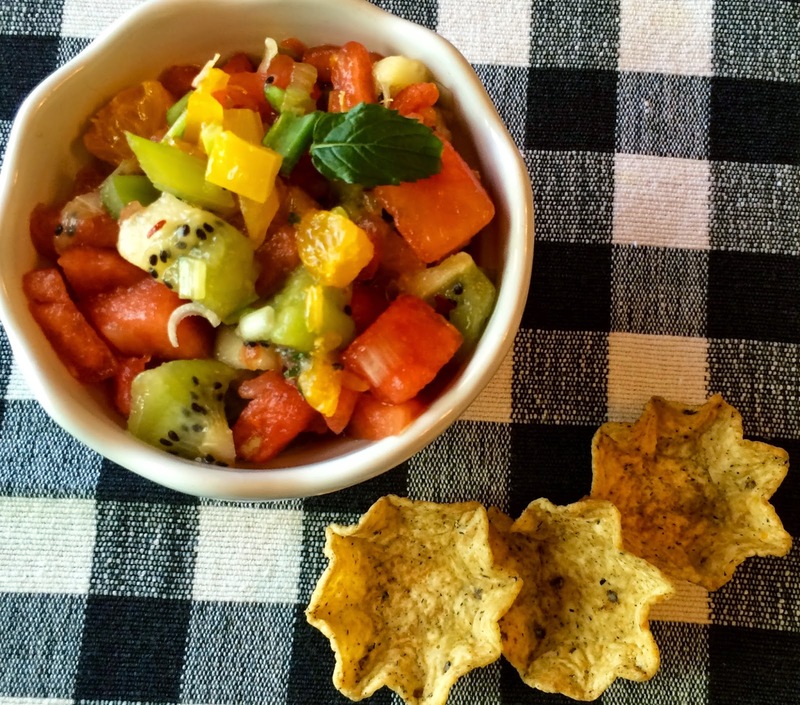 I Made Watermelon Salsa - again! We had some people over for appetizers on Wednesday. My family liked my Watermelon Salsa so much on Monday, that I made it again for our party. A few weeks ago I came across a recipe from Joyful Healthy Eats for Creamy Baked Goat Cheese Dip. Although it had been published as a holiday appetizer, it worked well for a warmer weather party as well! Instead of 2 tablespoons each of red and yellow peppers, I used 4 tablespoons of just yellow pepper. This was the only color pepper I had, and the end result looked little less Chistmas-y! I added about 2 tsp. of honey to the tomatoes with the balsamic vinegar, as I decided we would prefer this to be a little sweeter. Please go to Joyful Healthy Eats for the recipe, as it is not really mine to publish! I hope you enjoy it. We served it with pita chips and bagel bits, and it disappeared quickly. Sometimes I misquote my mother. While her voice is often in my head, her advice can get a little muddled. (Sorry Mom!) Anyway, I am sharing a little of her wisdom here today. I can't quite remember if my mom used to tell me "A house isn't tidy unless all the beds are made" or "A house always feels cleaner when the beds are made." Either way, the statements are both true. My mom would agree with this quote from a commencement speech at the University of Texas! Almost instantly, when you make a bed the room feels better. More organized, neater. Just that simple accomplishment often spurs me on to pick up the rest of the room. If having a tidy home isn't reason enough, a neatly made bed is much more welcoming at the end of a day than a rumpled one. I think I was an adult before I really learned to make my bed, or cared at all about how or if I even made it. Through middle school, I rode a school bus for 30 minutes to get to school. My mom expected that I would neatly make my bed before I left the house. I can remember more than one occasion when my exasperated parent marched me back upstairs to complete the task, despite my pleas that the bus was coming and I would miss it. I knew every short cut, or so I thought. Just pulling the bedspread up over the pillow, without regard to sheets and blankets underneath was my specialty. Somehow though, my mom never fell for it! We moved to a different house when I was a pre-teen. My twin sister and I shared a huge room, in which there was a double bed and a twin. I picked the twin - I had no interest in the added challenge of making a bigger bed. My mom used to tell me, "Susan, you will never be a nurse unless you learn to make a bed." Imagine my surprise, when as a nursing student we actually were tested on bed making! A nurse must make life and death decisions, and is required to have a solid knowledge of human anatomy, biology, physiology, pharmacology and pathophysiology. In comparison, bed making seems mundane, but it is an important part of patient care. Hospitalized patients sometimes spend many hours in bed. A mere wrinkle can lead to discomfort, or worse yet, a bedsore. My mom was right - I needed to know how to make a bed! I am sure my mother had her doubts that it would ever happen. I have, however, learned not only how to make a bed tightly enough that a quarter could bounce off it's surface, but I am even proficient at changing all the linens on a bed while an occupant is lying in it. Not only that - - it is a very unusual day when I do not make my bed! A buffalo rests on the bed in our guest room when guests are not in it! A while ago, I wrote a post about writer's block. In it I mentioned some of the ways I come up with ideas for the articles I write. Can you guess when I got this idea? Yes, indeed - I was making my bed! Last week I made a delicious Slow Cooked Shredded Beef Ragu Pasta recipe from Recipe Tin Eats. I snapped a photo of a serving of Slow Cooked Shredded Beef Ragu Pasta - before it was consumed by my family recently. This recipe reminded me of a helpful way to save a penny - and the planet. The ingredients for this recipe included three tablespoons of tomato paste. As is so often the case, this was a smaller amount than what was in the can. While I was saving the remainder for another use, I realized it has been quite some time since I shared my tip on this blog for how to avoid wasting the excess. I used to publish a weekly series called "Seven Tips to Make the Most of a Moment." My suggestion for how to save leftover tomato paste for future use was included in one of those posts, and published exactly one-year ago today! 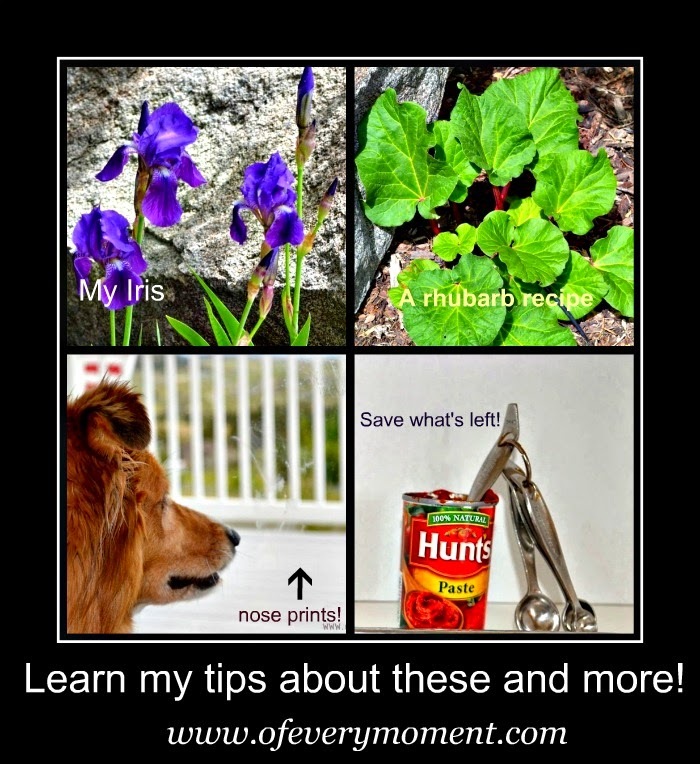 That same post also included a solution for removing pet nose-prints from your windows, a movie and book suggestion, and more. Life is full of coincidences! The main character in the movie I reviewed in this post last year was Matthew McConaughey. Coincidentally, just before I wrote this article for today, my husband and I watched Interstellar - another of McConaughey movies! The plot of Interstellar seemed improbably - at least right now! None-the-less, this movie was well filmed, kept me on the edge of my seat, played with my emotions, and had a "stellar" cast. Today, it has me thinking a lot about our place in the galaxy! For the riveting video preview of Interstellar, click the Amazon link below, and then on the video icon you will see in the left margin. Just watching this preview makes me want to see the movie again! I don't really want to live anywhere else! Saving left-over tomato paste seems like a small thing to do. It is not just a way to save a few pennies though, but an environmental friendly thing to do as well. Image how many less cans would be produced and discarded if we all did little things like this! This movie makes me think we better start taking better care of planet Earth. What is your favorite thing I mentioned today - or in the linked post from a year ago? Note: In the spirit of full disclosure, this post contains affiliate links. If you make a purchase after clicking on one of them, it would not affect the price you pay but I may receive some small compensation. All opinions expressed, however, are entirely honest and my own. I hope your weekend - whether three days or two - was wonderful! Throughout the weekend, I existed primarily on yogurt and toast. I was just too busy, and not at all interested in cooking for myself! By Monday however, once my guys were both home, I was ready to cook a meal. Although it was blustery, the sun had come out and a menu of summer foods seemed the right way to celebrate Memorial Day. I've been wanting to make Beer Marinated Chicken, ever since Sinea Pies published the recipe on Ducks 'n a Row. I have never developed a liking for the taste of beer - but I've used it in some recipes and have always been glad that I did. This one took very little effort, and the end result was flavorful and very tender chicken. There is only one variation to the recipe that I would recommend. Instead of saving the marinade to use to baste the chicken on the grill, there was plenty of cooked broth in the pan after the chicken baked in the oven. That worked very well instead. Monday morning, I paid a first-time visit to the blog Domestic Superhero, and found her recipe for The Best Ever Salty Smashed Red Potatoes. I decided these would be perfect with the chicken. Especially since I had all the ingredients on hand, and I'd be using the oven to pre-cook the chicken any way. 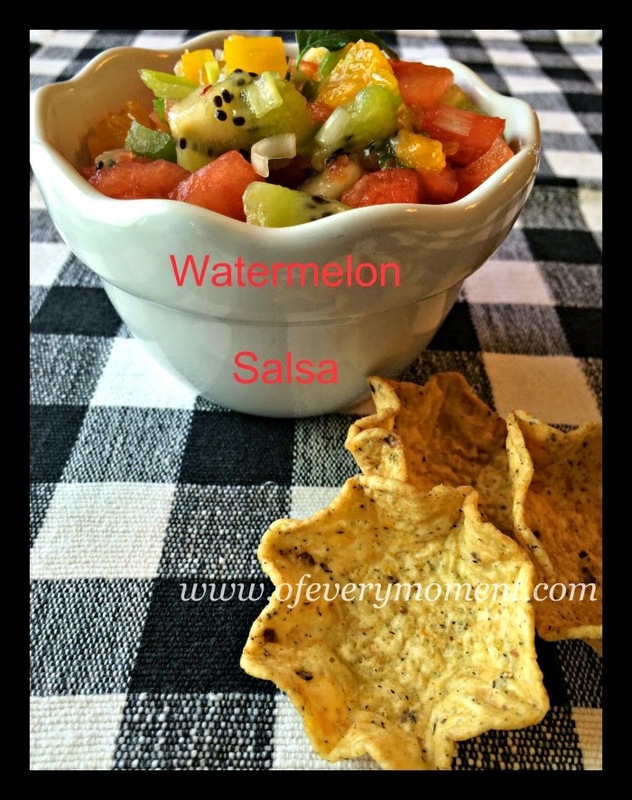 One of my favorite summer recipes last year was a Watermelon Salsa recipe I found on the website Eating Well. With a watermelon in the fridge, I decided to make the salsa. Imagine my dismay when I realized I didn't have the other ingredients. It is a 15 minute trip to town for us, so rather than drive to the store, I decided to experiment. I am so glad that I did! 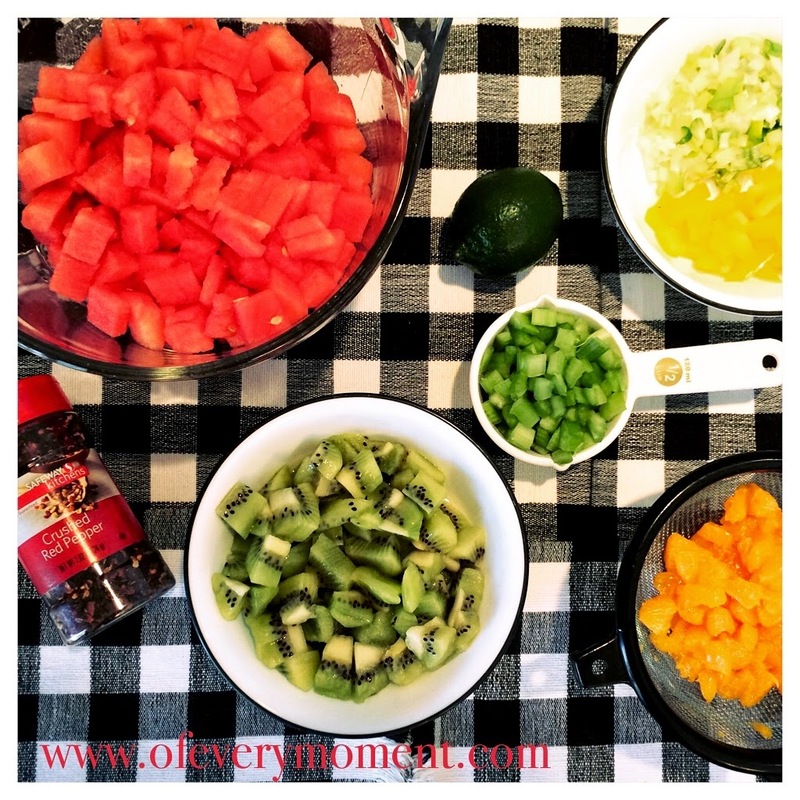 I created my own version of Watermelon Salsa. It was inspired by, but is quite different than the recipe I just mentioned. I actually think I like it even a little bit better - but maybe that's because I created it! It makes a really nice side dish or as a salsa with tortilla chips. Actually, Tostitos Scoops are perfect for this (and the Tostito company didn't pay me to say so!) because their shape and texture stand up well to holding just the right amount of salsa. I even just discovered that they make a multigrain variety! This salsa is quick to make. Or at least it would have been, if I hadn't put all the ingredients in individual bowls and spent time arranging them to be photographed. You can skip that step - and you will have a lot less dishes to wash! Chop all fruit and vegetables into small pieces. Place together in a large bowl. Add lime juice, mint, salt and red pepper flakes (to taste). Refrigerate for at least 15 minutes to allow flavors to combine. Place into a serving dish using a slotted spoon, leaving behind as much of the juice that has accumulated as possible. Serve with tortilla chips or Tostitos Scoops , or as a side salad. Note: Refrigerate leftovers. Best served within 12 hours. By the way, whenever I come across an interesting recipe, I save it on Pinterest. You might enjoy taking a look at all of the recipes I've saved there. 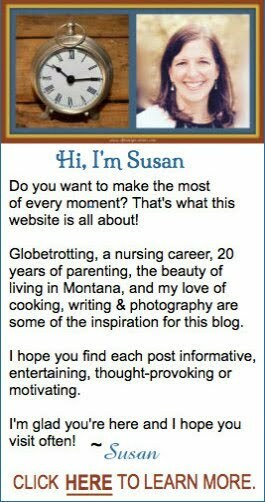 Just click on this link and it will take you to my Pinterest Boards. And, if you like this recipe, I really hope you will pin this post on yours! 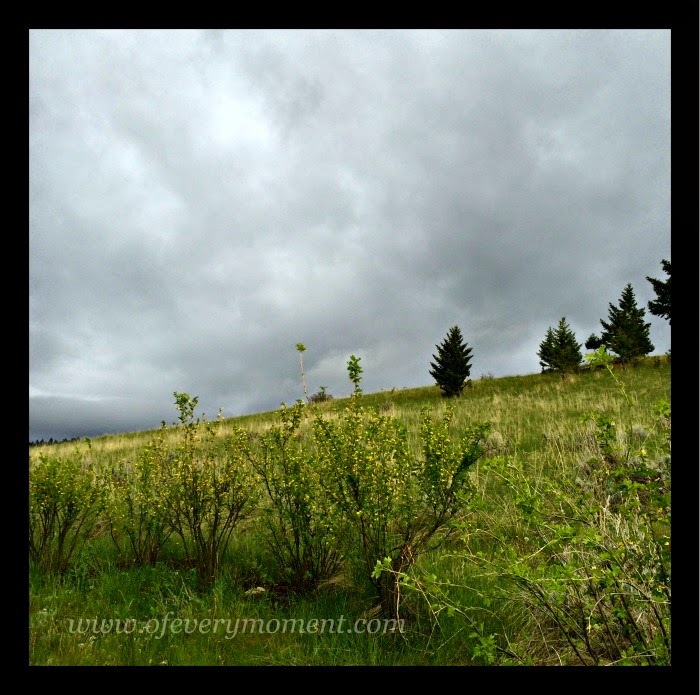 My Saturday Spotlight Series post today is all about remembering. Memorial Day weekend is here - already. It seems as though time has gone by awfully quickly. You'd think that once I write something, I would remember it. A look back in the archives of this blog however, just triggered a few memories! - last year they weren't falling until May 24th. Montana had an unusually early, warm spring. Last year on May 24th I wrote about experiencing some "cherry blossom snow." It happened a few weeks earlier this year. On a patriotic American holiday such as Memorial Day or July 4th, it is fun to serve foods that are red, white, and blue. I did a little experimenting in my kitchen yesterday, and created a muffin recipe showcasing these patriotic colors. I could call these "Memorial Day Muffins" for a another reason besides their patriotic colors: they bring up some long- ago memories for me! When I started thinking about what to write for this post, two very different examples of connections immediately came to mind. One involves a quick but valuable tip for bloggers; the other is the challenge of maintaining personal connections as we travel through life. I seem to be on a roll with trying to improve some things! The decluttering book I recently read by Marie Kondo and the tech-tips German Pearls website I just discovered have really motivated me. I've been busy! I Found A Blog With Helpful Tech Tips & Tutorials! 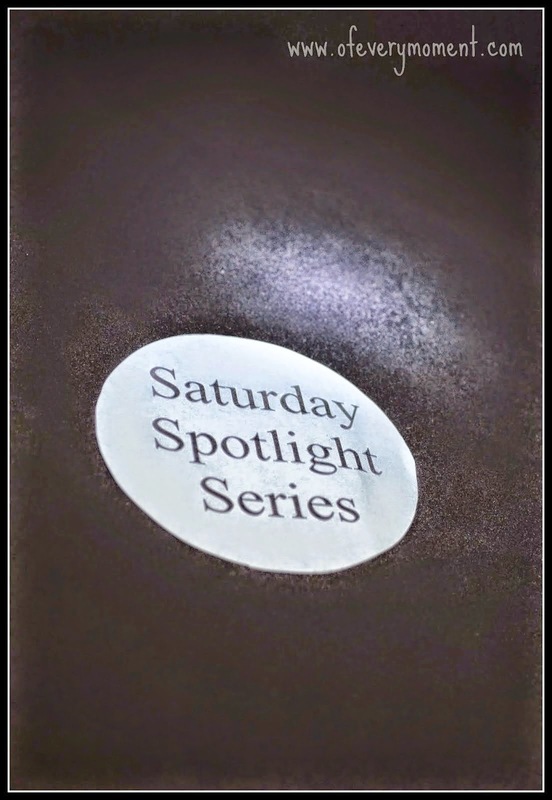 Today my Saturday Spotlight is shining on a source of information that I am very excited to share with you! It has the potential to save you time and prevent some moments of frustration. 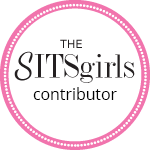 You will be wanting to say thanks - not to me, but to the blogger whom I just discovered this week! Pearls - but not from an oyster! I just found a type of pearls I really like - German pearls! I'm not talking about the kind that come out of oysters. 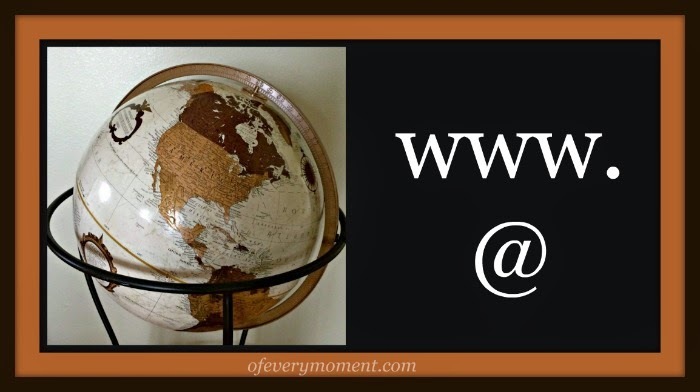 I am referring to a website I was lucky enough to find yesterday, at the linkup party, Foodie FriDIY. The name of the blog is .... German Pearls! The pearls of the website are not jewelry. They are “pearls” of information, to help non tech-type people - like me! 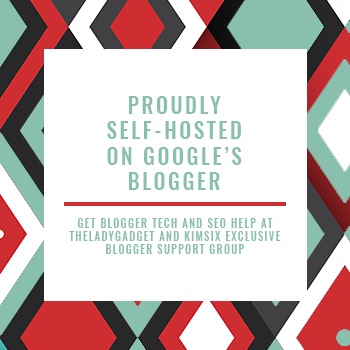 The blogger, Amy, is a self-professed “tech-geek,” and she writes posts with “tips and tricks for using your computer, smart phones and more.” Her site is (I think) fairly new, but she has already posted quite a few excellent articles that are worth spending some time reading. Amy provides "Tech tips for non-tech types"
Today I am sharing some thoughts I've been having about contentment. But first, a question: Have you read Love the Home You Have: Simple Ways to...Embrace Your Style *Get Organized *Delight in Where You Are , by Melissa Michaels? Much of the world observes Mother's Day, although different countries do so at different times of the year. In the United States, (where I live now) Mother's Day is the second Sunday in May. It is a day designated to honor our mothers, mothers-in-law, grandmothers, the mothers of our children, and all of the important mothers in our lives. Sometimes though, despite it getting a lot of media attention, Mother's Day can somehow catch us off-guard. You fully intended to think of a way to make Mother's Day really special this year. But - - how did this happen?! It is suddenly the Saturday of Mother's Day weekend, and you have no plan. Yikes. You could still buy flowers or chocolate at the grocery store, but that may not seem quite special enough, and might not even be an option at this late date, if Mom is far away. Don't despair and certainly, don't give up! It is true that there is no way that gift you were thinking about ordering on-line will now arrive on time ... and it is much too late to have a piece of jewelry personalized ... and there's no way you could possibly afford to surprise her with a plane ticket departing tomorrow for Hawaii! BUT - it is still possible to make tomorrow the perfect Mother's Day for the important mothers in your life! Today my Saturday Spotlight is shining on Mexican food, in honor of Cinco de Mayo. Cinco de Mayo, literally translated, means “5th of May.” Although it is not a celebration of Mexican Independence day, Cinco de Mayo is a holiday celebrating a victory the Mexican army had over the French. Today I am sharing an enchilada recipe that is perfect for a Cinco de Mayo party, a pot luck, or an easy family meal. I lived in Spain for a number of years, so many people assume that I know a lot about Mexican cooking. The two cuisines are really quite different, but I love both. I have discovered a number of good Mexican recipes over the years. Many years ago I got the idea for this dish from a recipe on the side of a bag of Kraft cheese! I have added quite a few more ingredients, and changed the method quite a bit however, so it now hardly resembles the original recipe. My guests have always enjoyed it - and I hope that you like it as well!